Engineering department of the company performs calculation of DWDM networks of any complexity in short terms. Our engineers calculate more than 200 projects every year, and dozens of them reach the practical implementation stage. Optimization of networks to decrease capital and operating expenses. We have a profound experience in designing telecommunication systems based on new formats of modulation of the optical signal. We developed methods of optimization that make it possible to achieve optimal performance for combined networks where both coherent channels 100/200 Gbit/s and noncoherent channels 10 Gbit/s are transmitted simultaneously. Due to this our customers successfully put in operation 100G channels on an old infrastructure that was intended for 10G channels. We use self-engineered specialized software for most effective design of DWDM networks. For calculation of networks of high complexity a working group is usually created with experts of R&D department of the company. R&D department performs theoretical analysis and numerical simulation of DWDM networks of complex topology, simulation of new components (optical amplifiers, transponders and other devices), simulation and analysis of linear and nonlinear effects using the OptSim™ software and other tools. 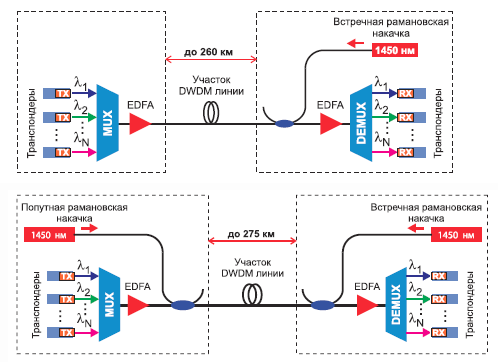 The use of coherent transponders makes it possible to build DWDM lines without passive dispersion compensators. Mathematical dispersion compensation takes place in the receiver’s DSP (digital signal processor). The most cost-efficient solutions used erbium doped fiber amplifiers (EDFA). The simultaneous use of a power amplifier and a preamplifier allows transmission of 16 optical channels for a distance up to 155 km and 80 channel for a distance up to 130 km. Simultaneous use of the transmission amplifier and preamplifier allows to organize 16x100 Gbps channels in lines up to 225 km or 80 channels in lines up to 205 km in length. Stock 3 dB was taken into account in the middle of the span. Применение встречной рамановской накачки телекоммуникационных волокон, совместно с усилителями EDFA, позволяет организовать 16 каналов 100 Гбит/с в линиях протяженностью до 260 км, и 80 каналов 100 Гбит/с при длине пролёта до 235 км с запасом 3 дБ в середине пролета. Добавление попутной рамановской накачки позволяет увеличить эти цифры, соответственно, до 275 км и 250 км. 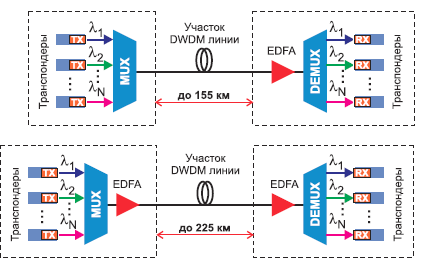 Сверхдлинные участки DWDM-линии до 475 км. Используется технология ROPA (remote optical pumped amplifier) – удаленная накачка волокна, легированного эрбием (EDF). Накачка осуществляется по двум волокнам: сигнальному и дополнительному. Используется волокно со сверхнизкими потерями. В лаборатории «Т8» успешно прошли испытания системы передачи 10*100 Гбит/с каналов в сверхдлинной однопролетной волоконно-оптической DWDM-линии на 500 км.